From the powdery peaks in Vermont and Lake Tahoe to the towering slopes of the Rocky Mountains, skiers will be in ecstasy from coast to coast with these top ski resorts. It does not matter whether you are a novice boarder or a seasoned skier; the gentlest of trails and the deadliest of black diamond moguls will keep your heart pumping. In the east, the rural, hometown scene is a comfortable atmosphere after a day on the slopes. Huddle by the fire with a mug of cocoa within the rustic furnishings. Toward the west, soothe and soak your muscles in an outdoor hot tub while the surmounting obstacles you have conquered retreat in the distance. Of course you seek a downhill adventure; these resorts are sure to meet your towering expectations. One of the hidden gems of the downhill world, Crystal Mountain Resort and Spa offers Midwest travelers a world-class downhill experience. Beginners can start by heading to Totem Park for a downhill lesson or two. Once you've established your skills, head to the trickier runs, or explore the area on miles of trails. During the winter months, you can enjoy a Ski & Stay package designed for skiers and snowboarders looking to get the ultimate experience. You don't have to travel to the Rocky Mountains to experience an outstanding Ski Resort. Start planning your trip to Crystal Mountain today! A premier stay for the traveler at heart, Stowe Mountain Lodge is a Vermont sanctuary for outdoor adventure. Found at the base of Mt. Mansfield and Spruce Peak, Stowe Mountain is surrounded by slopeside fun and dedicated to enhancing your skiing experience. Summer months are highlighted with two 18-hole golf courses hugged by forests, streams, and a mountain backdrop. The lodge mimics the surroundings indoors and out with rich colors, natural décor, and walls of glass allowing the sunshine in. A family winter escape is waiting at Smugglers’ Notch Resort! Smuggs’ condos provide a comfortable home in the Vermont Mountains. The resort’s 78 ski trails have cruisers for beginners and a triple black diamond to challenge any expert. Off the mountainside are 24 kilometers of snowshoeing trails and more outdoor fun. Have young ones new to outdoor sports? Snow Sport University will get them up to speed! With so much fun, you’ll need to wind down in the hot tubs or with a soothing massage. 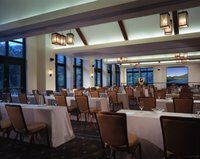 When you hear “Breckenridge,” you think skiing; therefore, it’s no surprise Grand Lodge on Peak 7 is prepared for your perfect ski vacation. Awaiting outside the door is Independence Superchair to take you up Breckenridge Mountain. After skiing, Sevens Restaurant has casual eats with peak views. Try a post-dinner sleigh ride or the outdoor hot tub to wind down. Conveniences such as four private movie theatres, a family fun center, and the Soothe Day Spa keep everyone at Grand Lodge satisfied. Located near Breckenridge Ski Resort and Breckenridge’s Historic Main Street, Grand Timber Lodge is perfect for your next ski vacation. Breckenridge is one of the leading ski areas in the nation and competes yearly for the title of “Most Popular Ski Resort in the Country.” At Grand Timber Lodge, the Snowflake chairlift at Breckenridge Ski Resort is just steps away, giving guests prime access to their world-class terrain. With 2,908 acres of skiable terrain, 187 trails, and four terrain parks, there is something for skiers at any level. Let Grand Timber Lodge host your next Breckenridge ski adventure. The Grand Colorado on Peak 8, one of the most luxurious ski-in/ski-out locations in the world, offers slopeside luxury like no other. Located right at the base of Peak 8 of the world-famous Breckenridge Ski Resort, Grand Colorado is truly the epitome of ski-in/ski-out. In addition to their incredible location, the resort has an on-site restaurant called Robbie’s Tavern, a spa, and multiple indoor/outdoor pools and hot tubs. If you are looking for luxurious accommodations in Breckenridge with the convenience of ski-in/ski-out access just steps from where you are staying, then look no further than Grand Colorado on Peak 8. 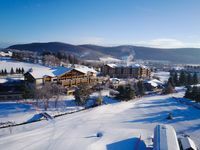 Holiday Valley Resort is Western New York’s true ski and snowboard destination. Featuring 58 slopes spread over four different faces with a 750-foot vertical drop and 13 lifts, the resort offers ski opportunities for all levels. Make your reservations today and unwind in excellent ski-in/ski-out accommodations and take advantage of private ski lockers for each room at the inn. Choose from many accommodation options, including their standard rooms, condos, townhouses, and chalets. Rest those sore muscles at the end of the day with a soothing soak in the hot tub. 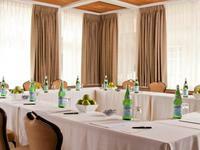 Grand Summit Hotel's majestic amenities and superb personal service only further the incredible skiing Park City is known for! The mountain's over 7,300 acres of ski-able paradise varies in difficulty, height, and speed- there's no question you'll find a run that's everything you dreamed of. While the veterans are out tearing up the black diamonds, beginners will love the ski school Grand Summit offers. All courses are taught by patient, caring, and top-notch instructors. Afterwards, return to Grand Summit for a hot bath and some well-deserved rest, then wake up the next day and do it all again! The Woodstock Inn & Resort is a quaint escape in rural Vermont where contemporary, rustic comfort meets a striking panorama. Upon entering, a six-foot stone hearth warms your heart, and the natural décor spreads to wood-beamed bed frames and organic baths. Of course, The Woodstock is not the only highlight. Suicide Six, the ski area, features thrills for everyone with 30 percent of the area for beginners and black diamonds with 250 yards of moguls for the skiing savants! The Ritz-Carlton Lake Tahoe sitting mid-mountain on Northstar California provides the luxury of the Ritz-Carlton with unmatched winter recreation. Known for its glade skiing, Northstar is home to 97 trails, parks, and a 22-foot Shaun White Super Pipe all right outside your stay. Allow the ski valet to take care of all your equipment the moment you arrive! Complimentary transportation will take you for a night out in the ice rink centered village so you can enjoy Lake Tahoe at the Ritz-Carlton. Southwest Colorado’s San Juan Mountains are a breathtaking backdrop no matter the season, and at Durango Mountain Resort, the backdrop is your adventure. While comfortably accommodating with slopeside scenes, Durango Mountain Resort will keep the fun rolling! In winter, allow the San Juan Ski Co. to take you on an untracked powder skiing adventure. Or, try ice climbing and snow bikes! Come summer, take a bike on the Purgatory trials or try the Plunge Zip Line! Durango has adventure year round! Ski-enthusiasts of all ages are in for an unforgettable experience in the beautiful Rocky Mountains. The luxurious Lion Square Lodge provides the best location you can imagine right at the base of Vail Mountain and Gore Creek. Ski-in and ski-out accommodations ensure you’re never far from all the action. Vail's incredible 5,289 skiable acres are just waiting for you to explore on your winter vacation. The terrain offers challenges for all levels, whether you’re a beginner to the sport or a seasoned veteran, you’re sure to have an exciting time! As you make your way through the European styled Beaver Creek Village you can't miss The Osprey at Beaver Creek watching over the area. As you enter the resort the ornate carpentry, plants and meticulous upkeep take center stage. Upon entering the room you see the state of the art entertainment system, spa products, granite bathroom counter tops, robes and a mountain view. You plan your day in the area with activities including skiing, shopping, sightseeing and ice skating. 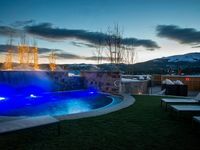 To end your day of adventure, start in the pool and then relax your body in the spa, The Osprey at Beaver Creek provides the complete skiing experience.